More than eight million people live in Jordan, an Arab country located to the east of war-torn Israel and Palestine. Yet every day, these people face barriers to Bible engagement. Children and adults lack access to Bible ministries that can equip them to read and study God’s Word. And refugees, more than 2.5 million of whom have registered in Jordan, suffer in the aftermath of violence and displacement at home. To equip the Jordanian people to engage with the life-changing message of God’s Word, the Bible Society in Jordan has partnered with American Bible Society to launch critical Bible ministries and initiatives. Trauma Healing: When refugees cross the border into Jordan, they often suffer from deep physical and emotional wounds. Many have survived war. Some have endured abuse. All have been displaced from their homes and communities. But regardless of their story, these people need the healing and hope that is found in God’s Word. Bible Engagement for Adults: In Jordan, church and community leaders have identified two barriers to Bible engagement: a lack of affordable Bibles, and a growing disconnect between young adults and the Jordanian church. 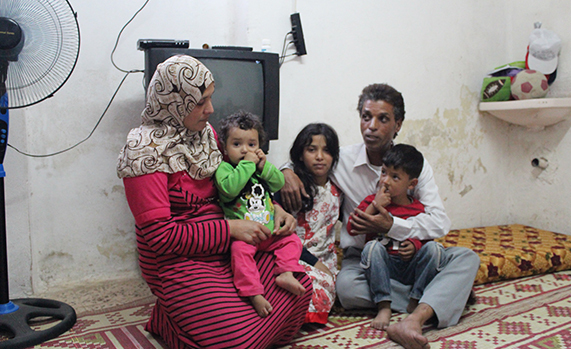 To overcome these obstacles, adults in Jordan need subsidized Bibles and revitalized ministry programs. Bible Engagement for Youth: Jordanian children rarely read and study Scripture, as few churches in the country offer children’s programs. For these children to engage with God’s Word, they need ministries and materials tailored to their learning style. Trauma Healing: To empower refugees to find healing in God’s Word, the Bible Society in Jordan, with support from American Bible Society’s financial partners, trains local leaders to teach a Bible-based trauma healing curriculum. The core text used in the program equips refugees to identify their pain, forgive their oppressors and release their suffering to Christ. In the coming years, the Bible Society in Jordan plans to train at least 100 leaders, who will use the curriculum to enable more than 3,000 refugees to find healing in the Bible. Bible Engagement for Adults: The Bible Society in Jordan, with support from American Bible Society’s financial partners, is working to make Bibles more affordable for the general public. To accomplish this goal, the Bible Society has begun selling discounted Bibles in accessible locations: bookstores, schools, camps, churches and public spaces. The Bible Society has also developed ministries that target young adults and their families, striving to bridge the gap between disconnected adults and the Jordanian church. Bible Engagement for Youth: To make the Bible accessible for Jordanian children, the Bible Society in Jordan, with support from American Bible Society’s financial partners, plans to host Scripture-focused summer camps and Sunday school programs. By implementing these ministries in churches nationwide, leaders on the ground expect to equip more than 1,000 children to regularly read Scripture. Ask God to bring healing to refugees suffering in the aftermath of war and violence. Pray for children in Jordan who have yet to encounter the life-changing message of God’s Word. Praise God for ministry leaders working to unite young adults and the Jordanian church.